Now you can update again. Updates to Windows 10 have been frequent recently, and it is not more than a week since Microsoft released a complete update to the latest release. 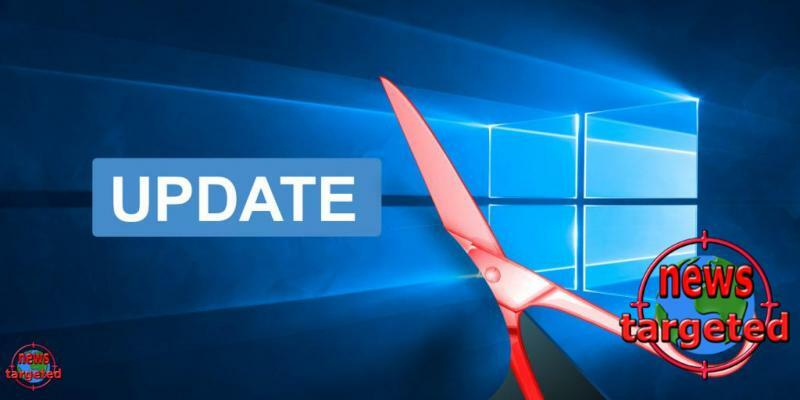 It's been a long time for the next "Patch Tuesday", but it does not stop Microsoft from sending out Windows 10 updates that are bugged with bug fixes and improvements. In this round, there are versions "Fall Creators Update" released last fall and April 2018 Update, launched in April this year, and as recently as the latest version of Windows 10, which is being updated. The update usually pops up under Windows Update and spreads Windows 10 April 2018 Update to OS 17134.319, which you can check under Settings - System - About - OS Version. Not everyone may receive the update at the same time - if you do not want to wait, you can download and install it through the Microsoft Update Catalog. Addresses an issue that causes the prompt “You’ll need a new app to open” to appear. This occurs when reloading a website on a non-standard port by pressing Enter. Addresses an issue that causes downloads to fail because Mark of the Web (MOTW) isn’t supported at the download location. Addresses an issue that prevents the DefaultSearchProvider policy from working when the FirstRunPage policy is in use. Addresses issue that causes the address bar to lose focus when a new tab is opened and the Allow web content on New Tab page policy is off. Addresses an issue that prevents the Microsoft Edge Configure Password Manager policy from suppressing the Save password prompt when the policy is disabled. Addresses an issue that causes downloads to WebDAV locations to fail. Addresses an issue with the file previewer for .html, .mht, and email (MIME) attachments in Microsoft Outlook. Addresses an issue that causes Internet Explorer security and certificate dialogs to display prompts in the background instead of the foreground in certain circumstances. Addresses an issue that may cause the system to become unresponsive when applications call the EnableEUDC API. Addresses an issue in multi-monitor scenarios that causes a spell checker context menu to appear on the wrong monitor. This issue occurs when the customer right-clicks a misspelled word in Internet Explorer. Addresses an issue that occurs when entering Japanese characters in a remote desktop session (mstsc.exe). Addresses an issue that occurs when using low-level mouse hooks with high integrity-level processes. Addresses an issue that prevents custom keyboard layouts from working correctly. Addresses an issue that prevents some Bluetooth devices from pairing with Windows. Addresses an issue in the Universal CRT that returns the expected output or a null character when calling _getch(). Addresses an issue in the Universal CRT that returns unexpected characters when calling the _findfirst() or _findnext() functions. Addresses an issue in the Universal CRT that prevents some functions from accepting narrow input or producing proper output with certain ANSI Code Pages. Addresses an issue with evaluating the compatibility status of the Windows ecosystem to help ensure application and device compatibility for all updates to Windows. Addresses an issue with the diagnostic pipeline for devices enrolled in Windows Analytics when the CommercialID registry key, “HKLM\Software\Microsoft\Windows\CurrentVersion\Policies\DataCollection” is present. Addresses an issue that prevents the App-V client’s scheduled task from syncing if the Device Guard lockdown policy is enabled. Addresses an issue that may cause the Local Security Authority Subsystem Service (LSASS) process to stop working when attempting to process a malformed security identifier (SID). moving from a corporate LAN or WLAN to a home LAN where domain controllers can’t be reached. Addresses an issue on some laptops that prevents sign-out from completing. The issue occurs when a customer signs out and immediately closes the laptop. As a result, when the laptop is reopened, the device must be restarted. Addresses an issue that occurs when enabling BitLocker from a local administrator account. Addresses an issue on devices with fingerprint sensors that were upgraded from Windows 10, version 1709. After the upgrade, users can’t use the fingerprint sensor to log in. Addresses an issue that causes some systems to take as much as 60 seconds longer to start. This occurs on systems that don’t have a smart card reader installed. Addresses an issue that causes a Direct Access connection to fail when the client authentication certificate is stored in the TPM device. Defender Application Control (Device Guard) in audit mode. Addresses an issue that causes a third-party VPN provider’s user interface to stop working after dynamically unloading Cryptui.dll. Addresses an issue that causes logging on to a Remote Desktop Session Host Server to occasionally stop responding. Addresses an issue that causes printing to an open or existing file to fail without displaying an error. This issue occurs when using Microsoft Print to PDF or XPS Document Writer. Addresses an issue where a daily, repetitive task starts unexpectedly when the task is first created or starts when the task is updated. Addresses an issue that prevents running subsequent actions when you create multiple actions in a task using Task Scheduler and the task is scheduled under the Stop the existing instance rule. Run Time in Task Scheduler displays the correct time, but the task doesn’t start at that time. Addresses an issue that prevents the debugging of minimized UWP applications. Addresses an issue with Visual Studio UWP Deployments that displays the error “The operation could not be completed because an unexpected host ID was encountered”. Addresses an issue that ignores the MM_DONT_ZERO_ALLOCATION flag. This issue leads to degraded performance, and, occasionally, error 0x139 appears. Addresses an issue that causes NTLTEST, DCLOCATOR, or joining an Active Directory and SAMBA domain to fail when using the NetBIOS domain name. The error is “An Active Directory domain Controller (AD DC) for the domain %domain% could not be contacted”. Addresses an issue that occurs when using encrypted email. If the customer selects Cancel when first asked for a PIN, multiple PIN prompts appear before the prompt finally goes away. Addresses an issue that prevents the Microsoft Help Viewer from rendering HTML content inside a Windows Help .chm file when the .chm file is stored on a network location. Addresses an issue in which the lock screen shows a solid color instead of an image specified by a policy before a customer signs in for the first time. Addresses an issue that causes Microsoft Edge to stop working when printing a PDF in a size 0 window. Addresses an issue that causes Microsoft Edge to stop working and to close associated webpage tabs. This occurs when certain PDF documents have timing issues when loading. Addresses an issue with a scheduled task that has an indefinite duration. The task starts immediately after it is created instead of starting at the time specified in the Triggers tab. Addresses an issue where GetSystemTime() may sometimes return an invalid value after using SetSystemTime() immediately before. unexpectedly empty when unlocking a machine after a successful logon. Username hint caching is expected to only work for lock and unlock scenarios and is not designed for logoff and logon scenarios. Addresses an issue that fails to maintain the tile layout after upgrading to Windows 10, version 1803 from Windows 10, versions 1703 and 1607. Addresses an issue that returns temporary values for the new Japanese Calendar Era. Addresses an issue in which Background Apps settings the user configured are lost when the device restarts because of incorrect registry ACLs. Addresses an issue that prevents Microsoft Centennial apps and some OS apps from displaying toast notifications. Addresses an issue in which all Guest Virtual Machines running Unicast dual NIC NLB fail to respond to NLB requests after the Virtual Machines restart.